Event Description : ART EXHIBITION : The Art Exchange Project presents "Spaces – Real and Imagined"
About the Show : Spaces can be of any kind: empty, crowded, agitated, peaceful, urban, rural, real, imagined. We occupy spaces and some occupy us. Space can be as minuscule as space in subatomic particles or as infinite as time. 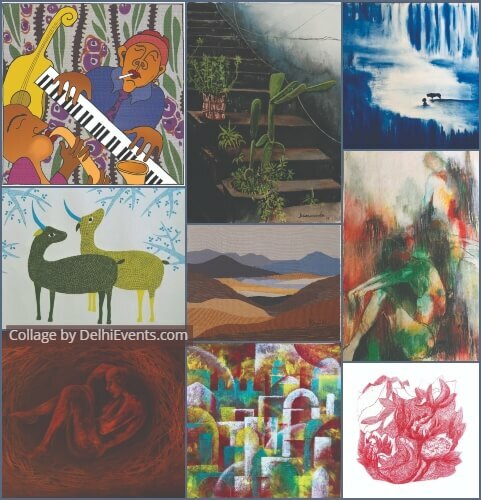 Works of thirteen artists interpret the concept in various mediums of watercolours, acrylics, oils, pastels, photography etc. They explore space as a tangible reality around them or as an abstract era of time, the relationship of animate and inanimate and what lies within. Their works are a depiction of what lies around them or a projection of their creative mind. Oxford dictionary gives different meanings of the ‘SPACE’. It means different things as a noun or a verb. The meaning also changes contextually, be it mathematics, universe, media, time or freedom. Hence when the theme was provided to the artists each interpreted it uniquely based on their experiences and concepts. While for one it was a specific era of music for another artist it is sixth sense. Abandoned spaces have stories to tell as do imagined cities. Some preserve the memory of pristine spaces experienced while others explore the relationship of humans with spaces they occupy. You, the viewer are invited to share these interpretations. Each work will speak to you a resonance of the word. Take with you the experience and contemplate your relation with space. Aarti is a visual artist, with over 20 years of experience, who expresses through photography, painting and graphic design. She graduated in Graphics from Govt. College of Arts, Chandigarh. And did her Masters in English from Panjab University. She runs two art communities in Delhi, The Art Exchange Project and Delhi Pencil Jammers with over 9000 members spread across the globe. Finding time between her design commitments she curates photography and art shows, makes stationery, conducts art workshops and organizes free art meet ups. Hey...love the painting on the top left...attractive and very appealing. Is it a series on music? Would love to buy them for my restaurant and pub. May I have the name and contact number of the artist please so I can book in advance? ?